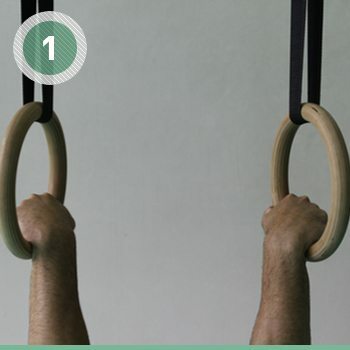 Sometimes when I simply hang on the rings with the palms facing away from my body (see image) my shoulders make a noise (don't know the exact word for that in English) and I feel a little snap. Doesn't hurt at all.. It's like my shoulders are getting into place because I only feel it once, in the very first time I hang before the training. Is it normal? If not, is there anything I could do to prevent that? Thank you guys for all the help! 1) Lots of Shoulder Dislocates (both with Overgrip and Undergrip). 2) Relaxing the lats and shoulders while hanging, so the shoulders move freely. I think that I saw few topics on this or some other forums regarding painless shoulder clicking and snaping. There are a lot of people experiencing similar problem, including myself. Without going into details the bottom line is bad flexibility. It's nothing too dangerous but it would be good to eliminate this by improving shoulder flexibility. I did a little research before posting, but maybe I was too specific; looking for the exact same position that I was doing. Maybe the topics you've listed will help me out. Edit: Ok.. Found some stuff to try. I'll post updates if I feel improvements. Thank you.